I’ve often heard people quip they would rather be lucky than smart. While intelligence and good fortune are certainly both valuable traits to possess, neither of these traits holds a candle to having a great sense of timing. Luck is a hit or miss proposition, and we’ve all known many a brilliant underachiever. However it has been my observation you’ll rarely come across someone who possesses a great sense of timing who is anything other than successful. As the verse from the old Kenny Rogers song goes “you have to know when to hold em and know when to fold em.” There are a few times in the life of every professional where staggering opportunities will present themselves. The question is not whether these opportunities exist, but rather what will you do with them when they cross your path. I believe one of the key differences between excellence and mediocrity is the ability to not only recognize opportunities, but to also possess an understanding and willingness to exploit said opportunities. Exploiting opportunities requires you not only possess vision, but also a corresponding bias to action (and a bit of courage as well). Rarely will you come across a static opportunity in the sense that it will stand idle and wait for you to act. Significant opportunities are not only scarce, but they typically operate on the principal of diminishing returns. Put simply, opportunities are time sensitive. The longer you wait to seize the opportunity the smaller the return typically is. In fact, the more likely case is the opportunity will completely evaporate if you wait too long to seize it. 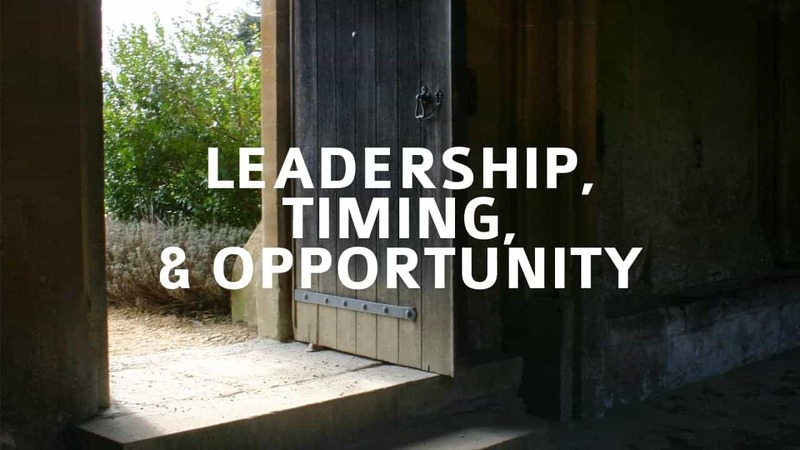 Keep this thought in mind; when opportunity knocks – answer the door. Alignment: The opportunity should be in alignment with the overall vision and mission of the enterprise. Any new opportunity being evaluated should preferably add value to the core, but if not, it should show a significant enough return on investment to justify the dilutive effect of not keeping the main thing the main thing. The core should be used to align, but not necessarily to exclude. Advantage: No advantage equals no opportunity. If the opportunity doesn’t provide a unique competitive advantage it should at least fill a void bringing you closer to an even playing field. Be careful however not to fall into the trap of “me too” innovation – copying isn’t innovating. Instead of leveling the field, think about tilting the field to your advantage, and where possible, the creation of a new field altogether. Assessment: Is the opportunity affordable, feasible, adoptable, and most importantly, is it actionable? An opportunity which cannot be implemented isn’t really an opportunity – it will likely be just another very costly distraction. Conduct your diligence before you pull the trigger, not afterwards. A ready – fire – aim approach to opportunity management usually fails to hit the target. Accountability: Keep in mind great ideas are not always the same thing as great opportunities. Ideas don’t always have a corresponding vision, nor do they always contain a framework of accountability which helps to ensure a certainty of execution. For opportunities to become reality they must be viewed through the lenses of organizational awareness and personal responsibility. Any new opportunity being considered should contain accountability provisions. Every task should be assigned and managed according to a plan and in the light of day. Any opportunity being adopted must be measurable. Deliverables, benchmarks, deadlines, and success metrics must be incorporated into the plan. The opportunity must be detailed and deliverable on a schedule – it needs to have a beginning, middle and end. Any opportunity not subjected to sound principles of leadership will likely fail. Achievement: Opportunities are great, but achievements are better. If any of the four items above are missing the outcome will be unrealized opportunity, or opportunity squandered and lost. The smart game is not played for what could have been, or should have been, but for what was achieved. Anybody in business ought to know how important timing is. Whether its skillfully negotiating a salary or clinching a client, timing is EVERYTHING. They say half of life is showing up, and that means showing up on time. Thanks for the great comment Alex. I appreciate you sharing your thoughts. Wharton professor Mike Useem calls it the "Leadership Moment." I believe that it's really one of the most significant keys to leadership. Leaders understand that you never know when the next opportunity may come across your bow. Take advantage of the moment to exercise leadership and you will rise above the rest. We all have opportunities come our way – the question is, what do we do when those moments occur? The last sentance in your comment is sage advice. Thanks for sharing Peter. Mike, we have to be on the alert. Added to your excellent points even something as simple as a wrong number could move into an opportunity. If a person has a small business with product people might use, it could be a great opportunity to add another client. Great points Robyn…Everything from chance encounters to a crisis can be an opportunity with the right perspective and willingness to act. Thanks for sharing Robyn.